In parts of Korea and China, moon bears, black but for the crescent-shaped patch of white on their chests, are captured in the wild and brought to "bear farms" where they are imprisoned in squeeze cages, and a steel catheter is inserted into their gall bladders. The dripping bile is collected as a cure for ailments ranging from an upset stomach to skin burns. The bear may live as long as fifteen years in this state. Rhinos are being illegally poached for their horns, as are tigers for their bones, thought to improve virility. Booming economies and growing wealth in parts of Asia are increasing demand for these precious medicinals. Already endangered species are being sacrificed for temporary treatments for nausea and erectile dysfunction. Richard Ellis, one of the world's foremost experts in wildlife extinction, brings his alarm to the pages of Tiger Bone & Rhino Horn, in the hope that through an exposure of this drug trade, something can be done to save the animals most direly threatened. Trade in animal parts for traditional Chinese medicine is a leading cause of species endangerment in Asia, and poaching is increasing at an alarming rate. Most of traditional Chinese medicine relies on herbs and other plants, and is not a cause for concern. Ellis illuminates those aspects of traditional medicine, but as wildlife habitats are shrinking for the hunted large species, the situation is becoming ever more critical. One hundred years ago, there were probably 100,000 tigers in India, South China, Sumatra, Bali, Java, and the Russian Far East. The South Chinese, Caspian, Balinese, and Javan species are extinct. There are now fewer than 5,000 tigers in all of India, and the numbers are dropping fast. There are five species of rhinoceros--three in Asia and two in Africa--and all have been hunted to near extinction so their horns can be ground into powder, not for aphrodisiacs, as commonly thought, but for ailments ranging from arthritis to depression. In 1930, there were 80,000 black rhinos in Africa. Now there are fewer than 2,500. Tigers, bears, and rhinos are not the only animals pursued for the sake of alleviating human ills--the list includes musk deer, sharks, saiga antelope, seahorses, porcupines, monkeys, beavers, and sea lions--but the dwindling numbers of those rare species call us to attention. Ellis tells us what has been done successfully, and contemplates what can and must be done to save these animals or, sadly, our children will witness the extinction of tigers, rhinos, and moon bears in their lifetime. "Ellis' meticulous and balanced report reveals the need for increased wildlife protection and a renewed assault on the trafficking in animal parts." "Ellis makes a convincing case that persistent belief in the curative powers of such substances as tiger bone and rhinoceros horn is the major force driving these animals inexorably toward extinction." "...his well-researched book presents staggering statistics about the illegal wildlife trade and brings to light an important issue too few people are aware of." "Ellis' extensive research gives us the inside story on the black market endangered species trade." "What a ride! Tiger Bone & Rhino Horn takes you on a road trip through horror and sorrow but leaves you infused with hope. Richard Ellis delivers a heart-achingly accurate account of the recent history of tigers, rhinos, and bears, and explains how much of their fate—along with the fates of other rare animals—rests in the hands of the growing black market for medicine made from their parts. While Ellis spares nothing in this landmark account of the wildlife trade, he also guides us toward what must be done to curtail it." Sy Montgomery, author of "Spell of the Tiger" and "Search for the Golden Moon Bear"
"A minutely researched, powerful, passionate and brave book. That we are driving other species to extinction because we compete with them for space, or eat them (as "bush meat") is bad enough, but that we kill endangered animals in vast numbers to provide "medicinals" of no therapeutic value is heartbreaking. Richard Ellis shows us what we must do to stop this needless destruction." Oliver Sacks, M.D., author of "The Man Who Mistook His Wife for a Hat" and "An Anthropologist on Mars"
"With its focus on staying healthy as opposed to treating illness, traditional Asian medicine is often hailed as a natural and friendly alternative to western therapies. 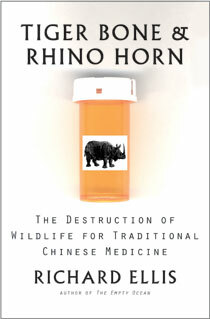 In Tiger Bone & Rhino Horn, Richard Ellis shows just how destructive and unsustainable many of these practices are." Mark Norell, American Museum of Natural History, co-author of "Unearthing the Dragon"
"To write a book such as Tiger Bone & Rhino Horn is a formidable undertaking. You must accumulate thousands of facts and spare no detail, no matter how terrible. It is always easier to write a piece of fluff and leave everybody smiling. But then, the horrors of poaching would continue unchallenged—like as tent caterpillars consuming an apple orchard, our species mindlessly consumes the others of the earth. At present, the most significant hope for our planet may be knowledge, and Richard Ellis has done a heroic job in providing a large measure of that." Elizabeth Marshall Thomas, author of "The Tribe of Tiger", "The Hidden Life of Dogs", and "Reindeer Moon"
Chapter 5.Where Have All the Tigers Gone? Chapter 7. Tigers, Rhinos, and Bears, Oh My!